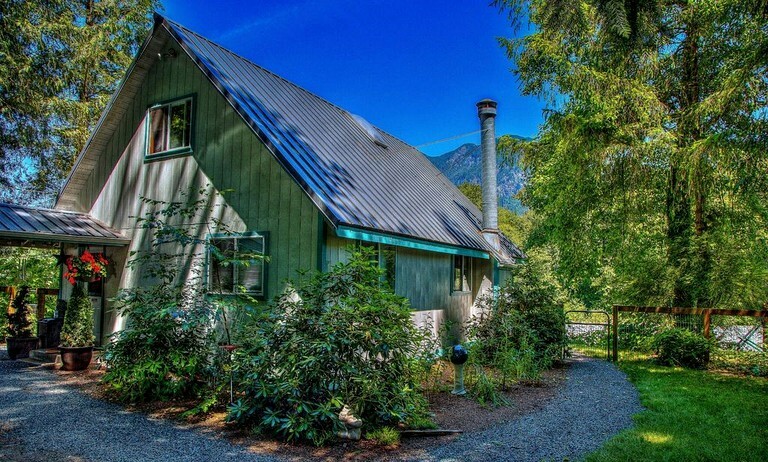 This gorgeous cabin is located in Gold Bar, near Monroe, Washington, on the banks of the Skykomish River, and can accommodate up to six guests. 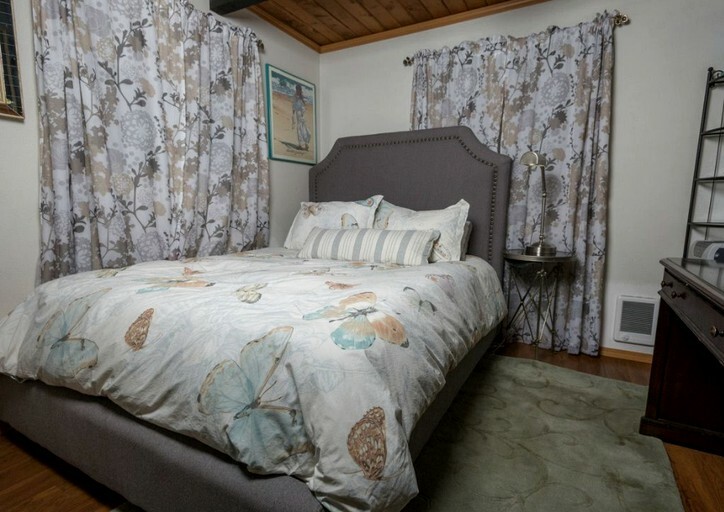 There are two attractive bedrooms and one full bathroom. 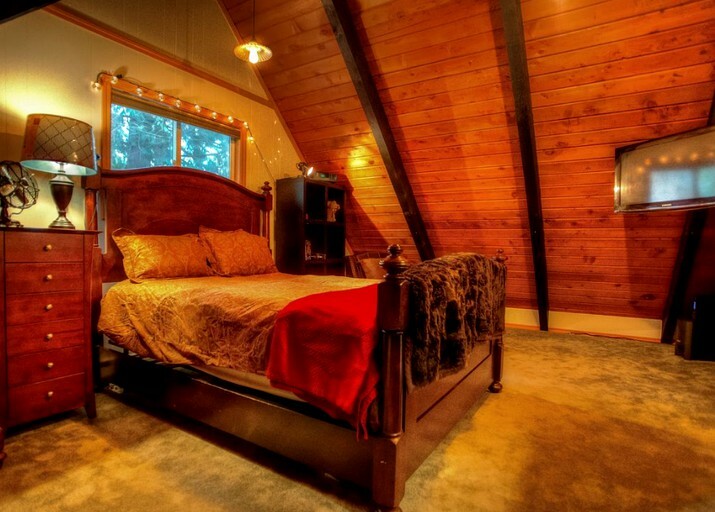 The first bedroom is up in the cozy loft area and has a queen-size bed, and its own TV. The second bedroom also comes with a queen-size bed, and features a large mirrored closet, for storing clothing and other items. Further sleeping space comes in the form of a queen-size air mattress. 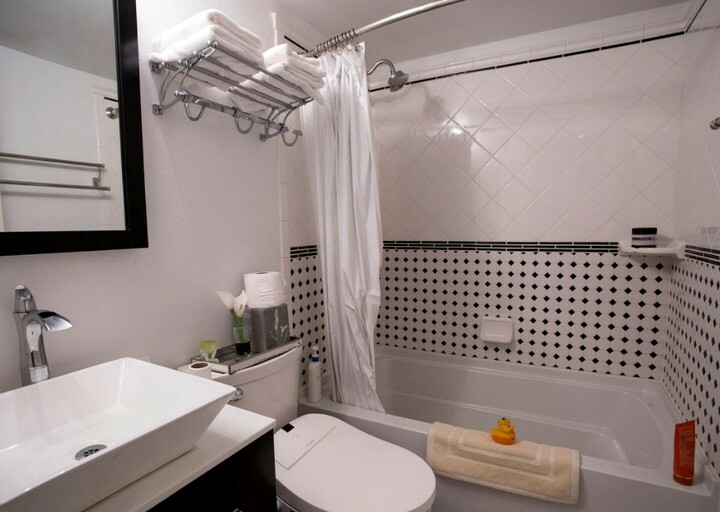 In the recently re-modeled bathroom, guests will find a toilet, a sink, and a shower and bathtub combination. Glampers will love the deep soaking tub, and the heated floor. Freshly-laundered linens and towels are provided by the host. In the inviting living room, guests will find a comfy and stylish curved sofa, with plenty of space for everyone. 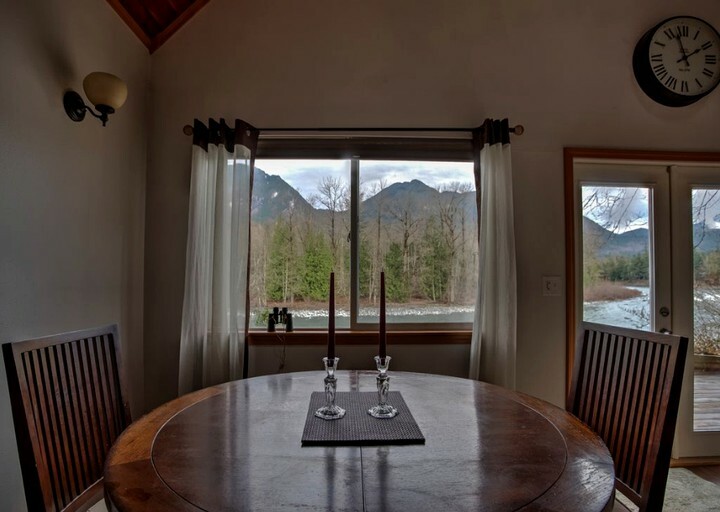 There’s a warming electric fireplace, and stunning river views from the French doors, and the large windows. For entertainment, there is a flat screen TV, with a selection of cable channels, and a DVD player, with a choice of movies. 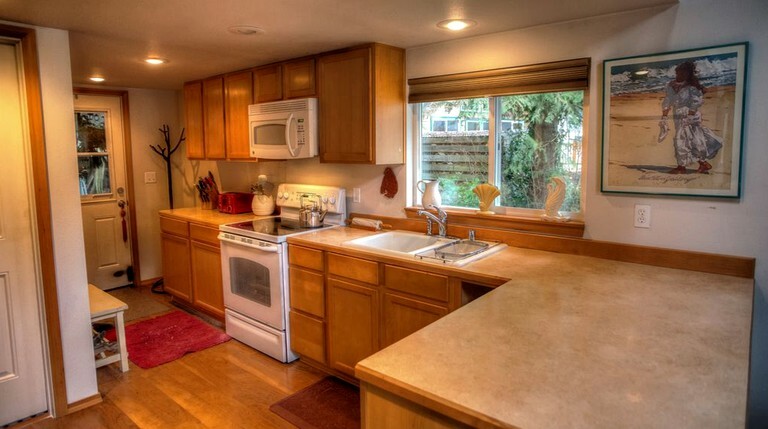 The fully equipped kitchen comes with a fridge, a freezer, an oven, a stove, a microwave, a coffee maker, and a dishwasher. Guests will have the use of an array of handy dishes and utensils. Meals and drinks can be enjoyed at the dining table, where there is seating for six people. Other amenities in the cabin include Wi-Fi access, heating, a hairdryer, and an iron and board. Glampers will benefit from some superb facilities at this property. Those traveling by car will be pleased to know that there is parking space for up to five cars on the premises. The front driveway features video surveillance, for added security. Outdoors, guests will have the use of a private deck, with a hot tub, a propane grill, and a lawn, where children and pets can play. 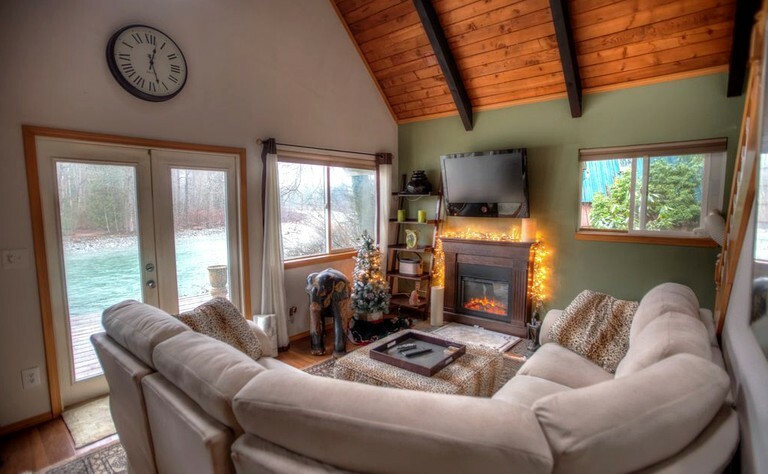 Inside, the cabin is heated throughout and includes two electric fireplaces, one in the lounge, and the other in the loft area. Glampers who need to stay connected can take advantage of the property's high-speed Wi-Fi connection, and there is plenty of entertainment on offer, with two cable TVs, a DVD player, and a selection of movies. With the huge array of activities on offer in this gorgeous region, glampers really will be spoiled for choice. 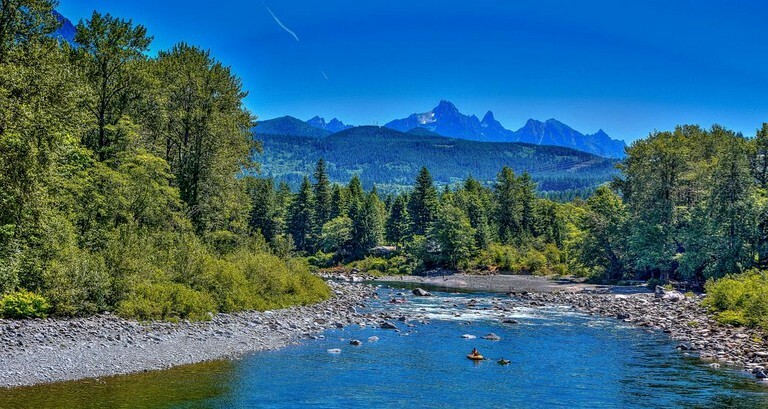 During the summer, the scenic Skykomish River is the ideal place to enjoy swimming, kayaking, and even rafting, with several local outfitters available, and exciting class five rapids on the river, for those daring enough to try it. For those who prefer to stay on dry land, there are miles and miles of superb hiking and biking trails close by, with something to suit most abilities. 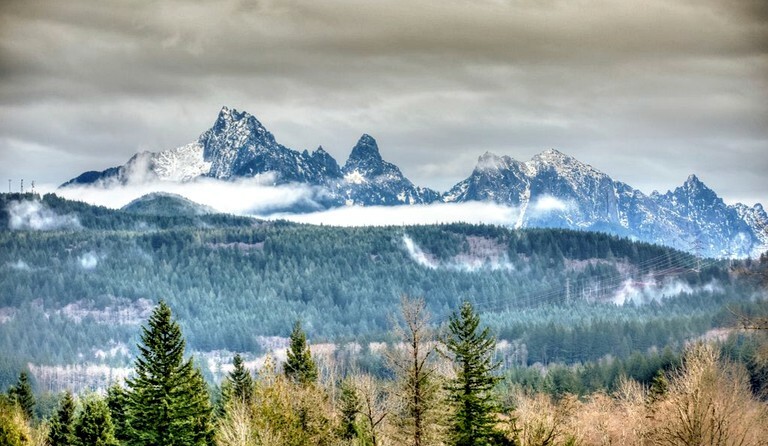 Popular trails close by including Wallace Falls State Park and the Iron Goat Trail, with nature lovers being able to spot some stunning flora and fauna along the way. Fishing enthusiasts can reel in steelhead at one of the two famous fishing holes near to the cabin, Cable Hole, and Wedding Dock Hole, and there are many other places to fish in the local area. Just two miles from the property, glampers will find the Skyland Ranch, which offers horseback riding classes, and hourly horse rental, throughout the year. Fans of winter sports can take part in skiing, snowboarding, and sledding at the Stevens Pass Mountain Resort, which is not too far from the cabin. The mountain is open for skiing between November and April, but also hosts many fun activities and events during the summer, such as hiking, biking, yoga, and scenic chairlift rides. For something a little different, glampers can travel an hour east to the famous Bavarian-style town of Leavenworth, where they will discover a quirky Alpine ambiance, unique shops, and excellent bars and restaurants. To the west of the property are the large cities of Everett and Seattle, with all of the usual big-city attractions, like shopping malls, movie theaters, live music, and sporting events. Guests can even take a whale watching trips from the coastal harbors. 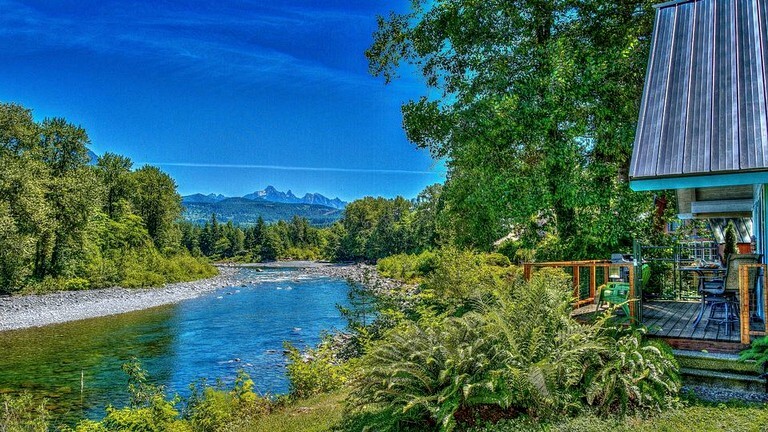 Glampers who want nothing more than rest, relaxation, or meditation, need look no further than their own backyard, as this cabin has a private hot tub, on the deck overlooking the river, and a lovely beach just a short stroll down the street. Pets are welcome at this property, for an additional nightly fee, per pet. The host does not allow parties or events.